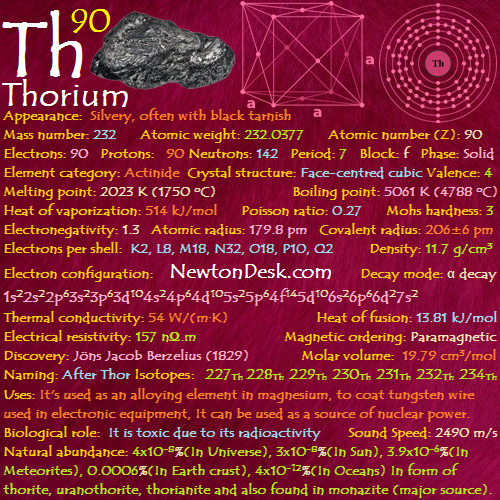 Uses: Thorium is used as an alloying element in magnesium, and to coat tungsten wire used in electronic equipment, and to control the grain size of plutonium used for electric lamps. Thorium can be used as a source of nuclear power, India and China are in the process of developing nuclear power plants with thorium reactors. Thorium oxide is added to glass to create glasses with an high refractive index and low dispersion (For use in High-quality camera lenses), Thorium oxide is also used as an industrial catalyst. Natural abundance: Thorium is found as the minerals thorite, uranothorite, thorianite and also found in monazite (which is the most important commercial source). Several methods are used to produce the metal, such as reducing thorium oxide with calcium or electrolysis of the fluoride. World production of thorium exceed 30,00 tones per year.